eHealthcare Consulting provides both ambulatory and inpatient solutions. independent groups and affiliate physicians. More emphasis is being placed on patient experience with reimbursements now being tied to quality rather than quantity. Most of these initiatives started with the CMS Meaningful Use program, but now private payers are also seeing the benefit. With programs like PCMH, Meaningful Use and ICD-10, it is only going to get more and more difficult to live in a paper-based world where integration and working together for better outcomes will reign king. Quality improvement is an ongoing process that acts as a measuring system to ensure we are exceeding the expectations of our patients. Our team of former Regional Extension Center and Health Information Exchange employees has developed a methodology that works and can help you with a successful transition. Click below to learn more! We offer services and solutions created to help you improve health outcomes and reduce costs in patient populations. Our pro-active approach involves a detailed assessment to help you identify and uncover patterns of progression. This assessment includes an analysis of quality metrics and data analytics in order to evaluate and help drive interventions. If you don’t have the following or know what it means to you, ask us how we can help! Data reporting – Where are you pulling the information? Is it accurate? How are you preventing re-admissions? Am I effectively using technology in my practice to improve patient outcomes? What populations and patterns are most prevalent in my practice? Are there mobile applications that I should be using? Does my vendor have mobile apps that already integrate well with their system? What are the struggles with it? Our ability to partner strategically with our clients to identify potential risk areas specific to their implementation is one of the things that set us apart from our competition. Our team helps our clients identify all key consulting needs and provides consultants that have operations and system software expertise. We remain committed to maintaining very close ties to various software communities and our strong relationships ensure that we provide quality candidates. 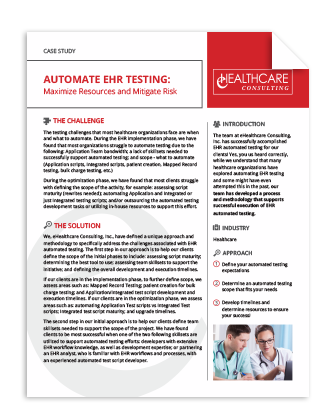 Implementing an EHR can be a daunting task for a healthcare organization. We believe there is no “one-size-fits-all” approach to EHR implementations, thus we focus our initial efforts on understanding the client’s culture and management style and tailoring a model that specifically meets their needs. Want to learn more about how the team at EHC can help?